This sweet wooden chalkboard from Tree by Kerri Lee is one of the more stylish and innovative chalkboards for kids that we’ve seen. 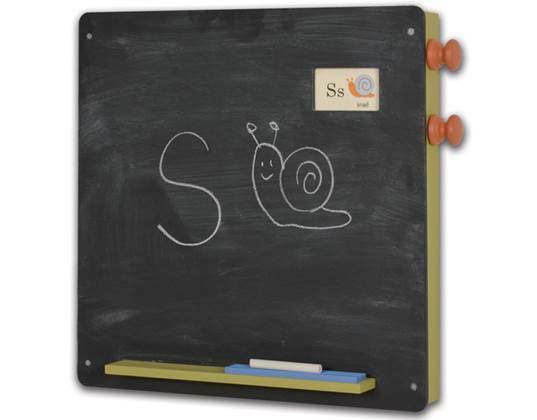 Not just a plain ol’ chalkboard, this board comes with a with chalk holder, eraser ledge plus a super cool peekaboo window which houses a fabric alphabet scroll! The alphabet scroll features beautifully illustrated letters A through Z and numbers 0 through 10. A great gift for kids learning how to write their letters and numbers, little ones can turn the wooden knobs to advance the scroll forward and back to the letter they want and then copy the letter onto the board. You can choose a pink, blue, green, or orange chalk holder. Bonus: Tree by Kerri Lee uses materials like sustainably harvested wood and non-toxic water based paints for their lovely vintage style products. This sweet wooden chalkboard from Tree by Kerri Lee is one of the more stylish and innovative chalkboards for kids that we've seen. Not just a plain ol' chalkboard, this board comes with a with chalk holder, eraser ledge plus a super cool peekaboo window which houses a fabric alphabet scroll! The alphabet scroll features beautifully illustrated letters A through Z and numbers 0 through 10. A great gift for kids learning how to write their letters and numbers, little ones can turn the wooden knobs to advance the scroll forward and back to the letter they want and then copy the letter onto the board. You can choose a pink, blue, green, or orange chalk holder. Bonus: Tree by Kerri Lee uses materials like sustainably harvested wood and non-toxic water based paints for their lovely vintage style products.